Our all-too-short Alberta summer continues. I am delighted to see that, with all the agreeable distractions of vacation and warm weather, the albertapatients community continues to grow. Your conversations in the discussion groups are instructive and the survey responses you have provided are enlightening! As everyone returns home, packs away the vacation gear and looks ahead to a busy school, family and business year, I want to thank you for being part of albertapatients. We are excited about the plans we are making, based on input that you have given us. Watch for a new survey about mental health care in Alberta in the next few weeks. We will, of course, keep sharing the results with you through newsletters and emails. The AMA recently conducted a survey about caregiving for seniors in Alberta. Not all of our survey respondents were caregivers - we were interested in how Albertans perceive caregiving overall, as well as any experiences that some may have had as caregivers or care recipients. We don’t have room to share all our results here today, but we have provided a few results that we thought were particularly thought-provoking. Please see Did You Know, below. 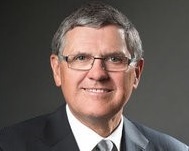 Caregivers and caregiving in Alberta. Did you know? For our survey, we defined “caregiving” as unpaid care or support for an aging family member, relative or friend who has a physical or mental disability, is chronically ill or is becoming frail. Almost 20% -- one in five -- are providing support like this today. Only 16% of respondents who are not currently caregivers believe they are not at all likely to provide such support at some point in their lives. On average, caregivers provide 12 hours of support in a typical week. In many cases, caregivers are helping their aging family member or friend with a variety of tasks over the course of each week. 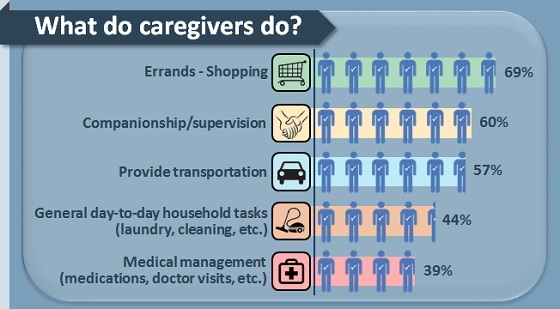 What do caregivers do? Many things!